The Egyptian government began taking steps to respond with the American offer to release 50 Egyptians being held in American prisons–including Shaykh ‘Umar ‘Abd-al-Rahman—in exchange for the release of 19 Americans accused in the case of foreign funding of civil society organizations. This is according to what was confirmed by Major General Muhammad Hani Zahir, an expert in military studies and international counterterrorism. Zahir in comments to the newspaper ‘al-Masriyun’ said it was necessary for Egypt to exploit America’s weak position, especially after condemning its citizens in cases affecting Egyptian sovereignty over its territory. He added that Egypt should not permit this exchange to take place unless the American administration agrees to release more than 500 Egyptians being held in American prisons, of whom the Egyptian foreign ministry knows nothing. We need to understand that kidnapping and taking hostages are a standard way of raising money and gaining things that would otherwise be unattainable in the Middle East. We are stupid if we have even considered making this offer. It will only lead to more situations where Americans are held hostage. It is time to come to the realization that all civilizations are not created equally and that to negotiate with barbarians is folly. We need to delay (and eventually cancel) all aid to Egypt and demand that they release the Americans they are holding hostage. This situation is an example of why America needs a strong President and a strong military. Currently we have a weak President who is trying to destroy our strong military. November of this year is the time to bring change to the White House. Rolling Stone posted today the Davy Jones of the Monkees has died of an apparent heart attack. I loved the TV show The Monkees. It was great fun and the music was good. My sympathies go out to his family and children. He had a wonderful smile and always seemed to be having fun doing whatever he was doing. Cardinal Francis George is the archbishop of Chicago and former head of the U.S. Conference of Catholic Bishops (USCCB). His comments on President Obama’s recent ruling on contraception coverage at Catholic Institutions were posted at CNS News yesterday. This is an intentional effort to take the voice of religious people out of the public square. When you consider that the basis of the American legal system is the Judeo-Christian ethic, this is a rather amazing step by our government. It is my opinion that all Christian churches in America need to stand with the Catholic Church on this issue. The church (other than the Catholic church) stood quietly while the Catholic adoption agencies in Massachusetts were shut down due to Biblical standards upheld by the Catholic church on homosexuality. We can’t afford to stand quietly now as Catholic hospitals are denied their rights to be Catholic hospitals. The Des Moines Register posted an article today about the Iowa House Democrats who have left the Capitol to protest two gun bills the Republicans are bringing up. House Minority Leader Kevin McCarthy has accused the Republicans of not giving enough notice so that Democrats could amend the bills. To pass, the resolution must be approved by both the House and the Senate in two consecutive general assemblies before voters would weigh in on the issue. It means that the earliest a vote could occur would be 2013, should the legislature act this year and next. The bill would rewrites the law on “reasonable force” so that a person may use force — including deadly force — against someone who they believe threatens to kill or cause serious injury, or who is committing a violent felony. The bill specifically says that a person is presumed to be justified in using deadly force if the person reasonably believes that deadly force is necessary to avoid injury or risk to his or her life. The first bill does nothing except echo the Second Amendment. What is the problem? The second bill simply allows a person to defend himself. Again, what is the problem? What amendments are needed? Somewhere along the line, we have lost the concept of having the right to defend ourselves and our property. I don’t think that violence is always the solution, but I do think we have lost the distinction between right and wrong in our victim mentality society. If someone murders someone, the murderer is often painted as a victim of some evil in society–poverty, bullying, disturbed childhood, etc. Parents are told not to spank their children and parental authority is undermined in our schools. If we are to survive as a society, we need to relearn the concept of good and evil and learn to deal with evil when it rears its ugly head! This is a free website. I started it in 2008 because I felt that a lot of valid news was not being reported. I appreciate everyone who has taken the time to read what I post. Now I am asking a favor. My husband and I will be taking part in the Parkinson’s Unity Walk in New York City on April 28. I would truly appreciate it if anyone who reads this post would support my efforts. The film below is a video done my niece who has Parkinson’s Disease. In order to contribute, please follow this link to the Parkinson’s Unity Walk, and click on Mary Griswold. Thank you. Looking For A New Congressional Candidate ? I am not sure how to take this, but I thought I would share it. This appears on YouTube. It’s a very positive ad! This is a chart from an article at Power Line posted yesterday. 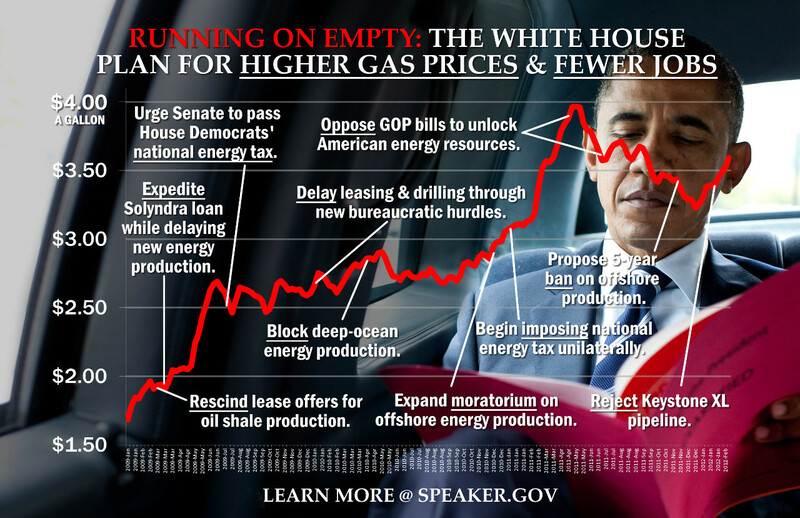 It shows the steps the Obama Administration has taken that have impacted American energy production. These decisions are not totally responsible for our current high gasoline prices, but they are part of the problem. Germany invested gargantuan amounts of money in green energy, doling out more than 130 billion in subsidies to install solar systems and spends an additional 10 billion per year subsidizing existing solar installations. Yet after all of this capital expenditure, Germany has little to show in terms of reducing green house gasses and helping the country’s power needs. Despite massive investment, solar power accounts for approximately three percent of Germany’s total energy… when the sun shines! To add insult to injury, Germans also pay the second highest price for electricity in the developed world, due mainly to the fact that they are heavily subsidizing green energy by adding the cost to everyone’s utility bills. The article explains that Germany will be phasing out subsidies for solar energy over the next five years. We need to learn from Germany’s experience. Yesterday CNS News posted an article about Afghan President Hamid Karzai’s response to President Obama’s apology for American troops accidently burning the Koran. There was nothing in the letter about punishing the people who killed Americans and Afghan civilians after the incident was revealed. Are the lives of the people killed as valuable as the Koran? What sort of value system is this? Aren’t the rioters responsible for their actions? There are a few points here that have not been stated often enough. The Korans were accidentally burned. They were originally confiscated because prisoners were using them to send messages. How did this news travel so quickly in a country that doesn’t even have electricity in many parts of the country? How many Korans has the Taliban burned when they have attacked mosques? Islam is a violent religion that stirs up its followers to violence. It is not conducive the free societies or peaceful nations. Until the followers of Islam renounce violence, there will never be peace in countries where Islamists are in control or in regions of the world controlled by Islamists. When in charge, the followers of Islam are violent people. History has taught us that. A friend of mine lost his job before Christmas and thankfully has recently found a new job. He is fairly high on the chain of command, and I was rather surprised that even when you are a responsible adult family man with a good work history, you are generally required to take a drug test before being approved for employment. That situation entered my mind when I began reading about the idea of drug testing welfare recipients. Just as my friend was drug tested before he could be gainfully employed, should welfare recipients be drug tested before they receive taxpayers’ money? Townhall.com posted an Associated Press article yesterday about the move to drug test people who receive money from the government. Data show that about 8 percent of the population uses drugs. And before a random drug testing program in Michigan was put on hold by a court challenge, about 8 percent of its public assistance applicants tested positive. In years past such legal challenges had a chilling effect on state legislatures, but that seems to have thawed. Michigan’s program was halted after five weeks in 1999, eventually ending with an appeals court ruling that it was unconstitutional. For more than a decade, no other state moved to implement such a law. Drug use is a problem. If people are drug tested to get a job, why shouldn’t they be drug tested to be paid money from the government? This year conservative lawmakers in 23 states from Wyoming to Mississippi _ where lawmakers want random screening to include nicotine tests _ are moving forward with proposals of their own. Romney, in an interview this month in Georgia, supported the idea. “People who are receiving welfare benefits, government benefits, we should make sure they’re not using those benefits to pay for drugs,” Romney said to WXIA-TV in Atlanta. Newt Gingrich addressed the topic with Yahoo News in November, saying he considered testing as a way to curb drug use and lower related costs to public programs. Drug use can prevent people from being responsible and holding down a job. Why should we support the drug habit of someone who would rather stay home and do drugs than work? I object to the idea of testing for nicotine–cigarettes are still a legal product–but I think testing for illegal drugs is a good idea. If people who want to be hired for a job need to be drug tested, why shouldn’t welfare recipients also be tested? Today’s Wall Street Journal posted an article on the auto bailout and the cost to American taxpayers. The article mentioned the fact that in order to get taxpayers’ money back, shares of General Motors will need to rise to $53 from their current $26 to recoup the Bush-Obama investment. But that’s not the real cost of the bailout. However things shake out, it will be only a fraction of the true costs in precedent and politicized investment. The bailouts signaled that major companies with union labor are too politically big to fail and undermined confidence in the rule of law. More troubling, the conversion of Detroit from an indirect to transparent Washington client continues to distort the auto market. Last November, Mr. Obama’s enviroteers tightened fuel economy regulations again, jacking them up to 54.5 miles per gallon by 2025—well beyond the standards Congress set in 2007. The auto makers agreed despite their misgivings because as wards of the state they had no political choice. So Chrysler, GM and Ford will still be forced to make cars that dealers struggle to sell profitably, only many more of them. The rule of law was not followed in the bailouts, and that will create problems for the companies in the future. The point is that the auto bailout isn’t an example of enlightened government revitalizing an industry after a market failure. It is a bailout in the wake of failed government policies and bad management that may keep going and going as Washington does whatever it takes to make sure Detroit keeps doing its political bidding. Government meddling in the private sector is never a good idea. Lesley Turner, a PhD candidate at Columbia University, looked at data on aid from 1996 to 2008 and calculated that, on average, schools increased Pell Grant recipients’ prices by $17 in response to every $100 of Pell Grant aid. More selective nonprofit schools’ response was largest and these schools raised prices by $66 for every $100 of Pell Grant aid. After adjusting for differences among schools, the authors find that Title IV-eligible schools charge tuition that is 75% higher than the others. That’s roughly equal to the amount of the aid received by students at these schools. Studies like these suggest that if one goal of government is to make college affordable, aid should become more thoughtful instead of merely more plentiful. And the total cost of federal spending on college isn’t fully known. That’s because spending on loans dwarfs that on grants. Student loans recently eclipsed credit card debt. The article reminds us that with high unemployment and the unavailability of the high paying jobs that graduates need to pay off their college loans, the taxpayers could wind up paying the bill for a lot of college tuition loans. The Obama Administration is using taxpayer money to subsidize electric cars. John Hinderaker at Power Line posted an article yesterday that pointed out that only 29 percent of Americans support those subsidies. Please follow the link to see a wonderful cartoon that explains exactly how electric cars work! The article at Power Line reminds us where the electricity for electric cars comes from–coal-fired power plants. Note, too, that as the Obama administration feverishly tries to put power plants out of business with onerous new regulations, the effect will be to force the cost of driving electric vehicles higher and higher. Man has been looking for the perpetual motion machine for centuries. We haven’t found it yet. Meanwhile, the Obama Administration is attempting to subsidize it! Andrew McCarthy posted an article today at National Review Online today about the recent events in Afghanistan following the accidental burning of some Korans. The facts are that the Korans were seized at a jail because jihadists imprisoned there were using them not for prayer but to communicate incendiary messages. The soldiers dispatched to burn refuse from the jail were not the officials who had seized the books, had no idea they were burning Korans, and tried desperately to retrieve the books when the situation was brought to their attention. Also understand this: In sharia societies, non-Muslim religious articles are confiscated and destroyed every single day as a matter of policy. In Saudi Arabia, where sharia is the law of the land, where Mecca and Medina are closed to non-Muslims, government guidelines prohibit Jews and Christians from bringing Bibles, crucifixes, Stars of David, and similar artifacts emblematic of their faith into the country. When that prohibition is violated, the offending items are seized and burned or otherwise destroyed. Moreover, though Saudis deny having an official policy that bans Jews from entering the country at all, reports are rampant of travelers’ being denied visas either because they are Jewish or because their passports bear stamps indicative of prior travel to Israel. The riots and killings that followed the burning incident were not justified. They should not be acceptable in a civilized society. Apologizing for them simply makes them appear justified. Where is the apology for the Americans killed? The riots and killings are a part of Sharia Law. When we apologize for someone else’s bad behavior, we are honoring Sharia Law. Since Sharia Law is in direct contradiction to a free society and human rights, that is not something we actually want to do. At the very least, our immigration laws should exclude entry from Muslim-majority countries unless and until those countries expressly repeal repressive sharia laws (e.g., the death penalty for apostates) and adopt American standards of non-discrimination against, tolerance of, and protection for religious minorities. If you really want to promote freedom in Islamic countries, an immigration policy based on civil-rights reciprocity would be a lot more effective, and a lot less expensive, than dispatching tens of thousands of troops to build sharia “democracies.” It would also protect Americans from people whose countries and cultures have not prepared them for the obligations of citizenship in a free society. Andrew McCarthy led the 1995 terrorism prosecution against Sheik Omar Abdel Rahman and eleven others. The defendants were convicted of the 1993 World Trade Center bombing and planning a series of attacks against New York City landmarks.He also contributed to the prosecutions of terrorists who bombed US embassies in Kenya and Tanzania. In prosecuting the case in the World Trade Center bombing, he studied closely the teachings of Islam to determine if terrorism was an aberration of the religion or an integral part of it. He concluded that the concept of jihad encouraged terrorism. Is This The Direction We Should Be Heading ? The Corner at National Review posted an article today by Andrew McCarthy about a recent court ruling in Pennsylvania. So let me get this straight. The assault victim, Ernie Perce, an activist atheist, paraded last October in a “Zombi Mohammed” costume. As a result of this, he was attacked by Talag Elbayomy. According to this judge, Mr. Perce’s First Amendment free speech rights are not valid since Mr. Elbayomy’s god was insulted. OK. So do this mean that if I want to attack someone physically for some of the anti-Christian artwork that has surfaced in recent years, I can do that and not be convicted? If I kill them, is it still ok? This is totally ridiculous. I am not sure if appeal is an option in this case, but it should be. The U. S. Constitution trumps sharia law. If the judge does not believe that, he has no business being a judge in America. Today Hot Air posted a story about the ongoing saga of Gibson Guitar Company. As you know Gibson Guitar in Memphis and Nashville was raided in August of last year (see rightwinggranny.com) by the federal government and charged with violating the Lacey Act. During that raid, the government confiscated property worth at least $500,000. The guitar manufacturer had not followed to the letter a small part of India’s laws in importing the wood for its guitars. They had not violated United States laws. Apparently, Gibson used an inappropriate tariff code on the wood. According to Reason.tv, “At issue is not whether the wood in question was endangered, but whether the wood was the correct level of thickness and finish before being exported from India.” In other words, Gibson’s violation had nothing to do with forest preservation. Turns out, the DOJ has filed no charges. That means Gibson hasn’t had its day in court to defend itself — and the government still has all that confiscated property. Thankfully, according to the article, Kentucky Republican Sen. Rand Paul has introduced legislation to amend The Lacey Act to remove each and every mention of “foreign law” in the Act and to substitute a civil penalty system with The Lacey Act’s current criminal penalties. I hope this is resolved quickly–Gibson needs its wood–they make fantastic guitars. Yesterday Ed Morrissey at Hot Air posted an article about what has happened to tax revenue in the Great Britain since the government put a 50% tax rate on wealthy residents. The new tax rate went into effect in January of this year. What did they expect? Those people who have accumulated large fortunes have also gained the knowledge of how to manage those fortunes or employ people who know how to manage them. Taxing the rich at a confiscatory rate decreases tax receipts and puts a larger tax burden on the middle class. Obama’s plan to hike capital-gains taxes to 20% and push a surtax on higher earnings will produce the same result here. The capital that might have gone to work in the US will go to work somewhere else or not at all, which will not just kill the direct revenues expected in static tax analysis from the hike, but also discard the revenues that would have occurred had the capital been put to work here. That’s the lesson from the British face-plant on surtaxes, and hopefully the US learns that lesson the easy way. At the risk of appearing pessimistic, I can’t imagine President Obama learning from the British experience. Hopefully the next president will be able to undo some of the damage that is about to be done. We Have Lost The War On Poverty–What Do We Do Now ? Big Government posted an article yesterday about the growing dependence of Americans on government and its impact–current and future–on our society. As the government has taken over the responsibilities of families, churches, and other charitable institutions, these institutions have become weaker. The Administration is allowing people to become fully dependent on them for their basic needs like food and access to health services, even encouraging it. The more they rely on the Government, the more Government has control of their lives and the less people feel they are capable of escaping their situation. Without responsibility and choices, they give up. An excellent example of this was presented in a study in 1976 by Langer and Rodin. It showed the effects of nursing home patients who were given responsibility and choices as opposed to those “where conformity and passivity is encouraged and every whim is attended to.” The latter dramatically declined in overall “health and well-being”. The study was extended to homeless shelters. When people were given both responsibility and choices they were much more likely to find work and a place to live. People do better when they have responsibilities and purpose. We need to bring back the concept that there is value in all work. Somehow we have lost that and have focused instead on over-educating our young people at high expense and leaving them with massive debt and unrealistic expectations. It’s time to reinvent America’s values and bring back people helping people (instead of government helping people) and the value of work and responsibility. I realize that as I get older I have less patience with stupid statements, but every now and then someone says something that sends me through the roof. Holdren and the Ehrlichs published “Human Ecology” with W.H. Freeman and Company in 1973. In June 2000, a study published in American Pyschologist debunked the notion that children in larger families have lower I.Q.s. But when Holdren appeared in the Senate Commerce, Science and Transportation Committee in 2009 for a confirmation hearing on his appointment to run the White House Office of Science and Technology Policy, he continued to argue for the benefits of “smaller families” on other bases. Why does this matter? Because the mindset of the Obama Administration is generally anti-family. A Canadian television program recently tracked down some of the people with the highest IQ scores in North America. One man who has an extremely high genius IQ works as a motorcycle mechanic, hangs out with biker gangs, and is frequently in and out of jail. …Qualities such as determination and vision can be more important to your ultimate success in life than the IQ number you started out with. Being creative, optimistic, and flexible are important hallmarks of many successful people. Common sense, the ability to get along with other people, and knowing a good idea when you see one, may be more useful qualities than having a genius IQ. Let’s look at that last paragraph again. Common sense and the ability to get along with other people are things that people learn in healthy two-parent families (generally with more than one child). A child with siblings learns to share–toys, the spotlight, successes and failures. A child with siblings (in a healthy family) grows up with a close support group that helps launch him into success. The other part of this equation is the definition of success. Is a stay-at-home mother who volunteers in the community less successful that the corporate executive? Is her work any less valuable? “The columnist Dr. Joyce Brothers answered a question sent into Good Housekeeping (February, 1981) by a mother of four asking if she should consider having another baby as follows: ‘Studies have shown that children reared in small families are brighter, more creative, and more vigorous than those from large families,’” the authors noted. When you consider that the Obama Administration is moving the country toward a philosophy of national dependence on government, there is always the possibility that the move to limit the size of families is part of a plan to make the total population’s dependence on government more affordable. If you would like to see the results of a governmental policy that discourages children, take a look at the current demographics of Japan and the impact that is having on the Japanese economy.